Has great propensity to spread like wildfire and will pop up in gardens year after year despite weeding. If you don't look for a month after weeding, more will have grown in the lawn or around the edges and in the cracks in paving! Surrounded by Stinging Nettle yet to grow taller. The stems are not straight but zig-zag and wavy and have many pinnate stem leaves. 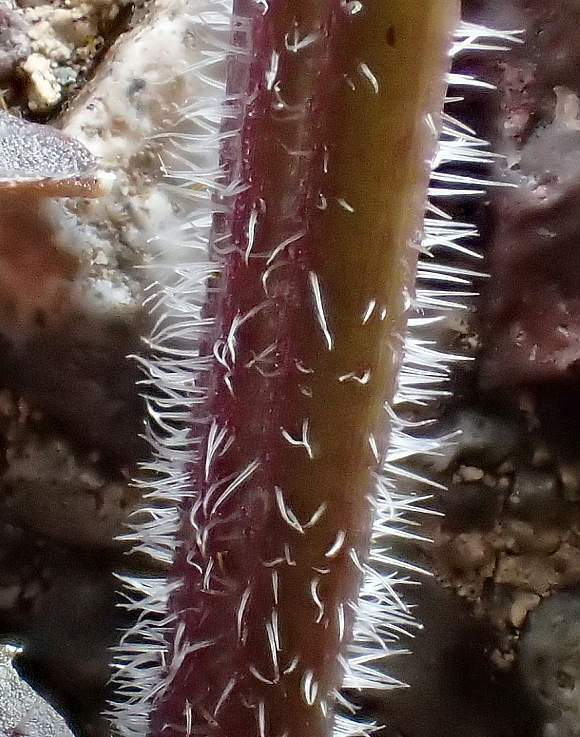 The stems can be hairy and, somewhat contradictorily, those of Hairy Bitter-cress have fewer hairs apparently. 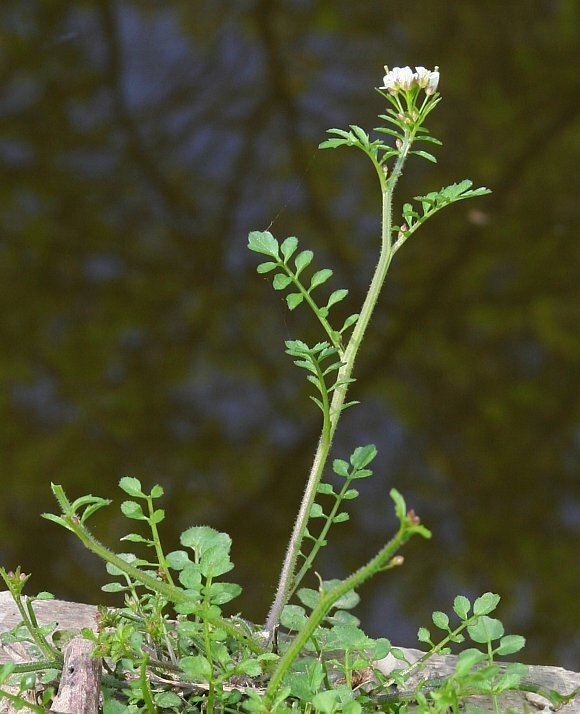 (It is the leaf stalks which are usually hairy in Hairy Bitter-cress, whereas the stems are usually hairless). Stems hairy and zig-zag with stem leaves numbering greater than four and up to 10. 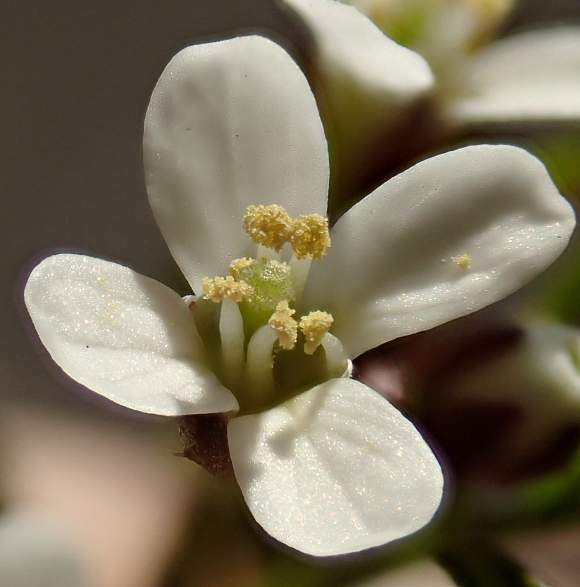 The flowers are white, very small, between 3mm and 4mm across and with four petals. The flowers only fully open in bright sunlight, as here. The seed pods long, cylindrical and curved. Un-like Hairy Bitter-cress which has but four stamens, this has nominally six stamens. Stem leaves pinnate, narrow and with few teeth. Petals splayed outwards, nominally six stamens with cream coloured pollen. 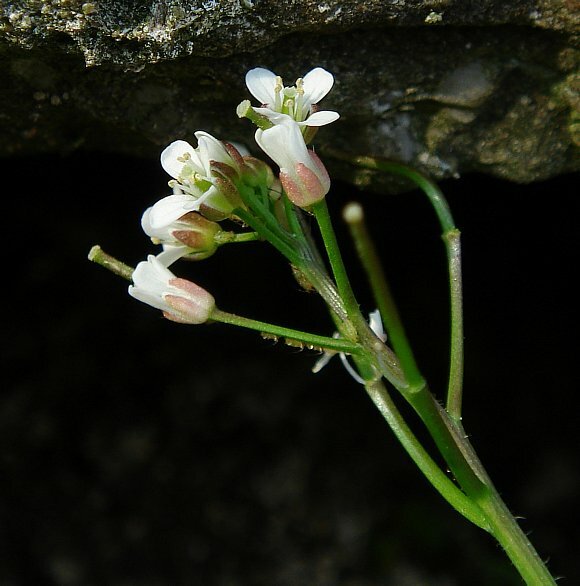 The shape of the upper stem leaves are also indicative of Wavy Bittercress, as is the wider opening of the petals (presumably to make room for 2 extra anthers). The seed pods are long and overtop the flowers although your Author thinks that that is not an identifying feature in the case of Bitter-cresses. The seeds can be seen at regular intervals in their pods by the slightly raised humps. Anther still attached to the pod on the right. Seed pods emerging from four of the flowers. Snow-white petals. And six stamens, two of which are slightly shorter than the other 4 as per spec. Anthers with pollen. Central pale-green style in the centre will become a seed-pod when fertilised and ripe. The six stamens, the two each side are slightly lower and are often missed in a stamen count. 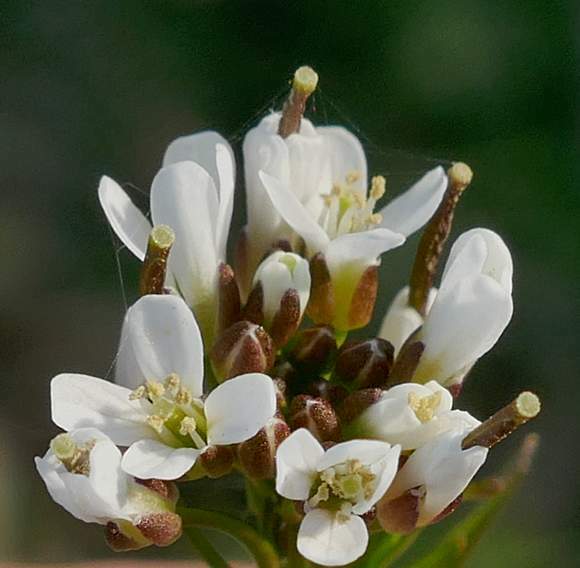 6 stamens for Wavy Bitter-cress, only 4 stamens for Hairy Bitter-cress. 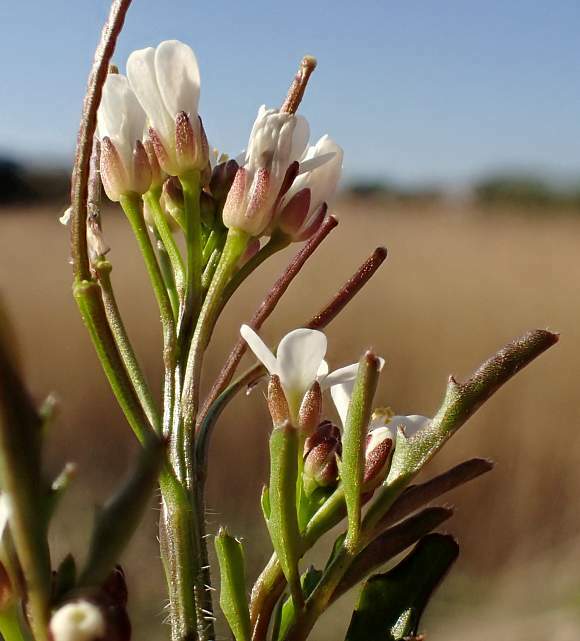 Not all stems are as hairy as this one, and this is not Hairy Bitter-cress, but Wavy Bittercress. 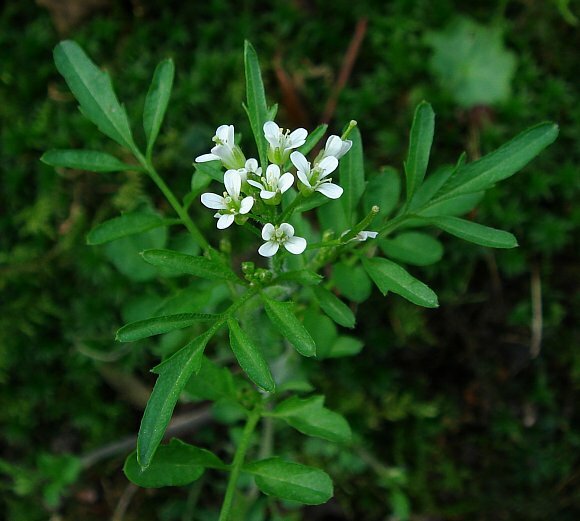 Easily confused with : Hairy Bitter-cress, but that has non-hairy stems, whereas Wavy Bitter-cress has hairy stems! 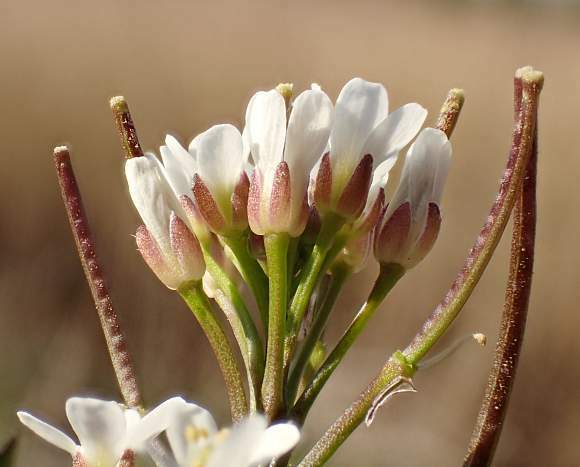 Also, the seed-pods of Hairy Bitter-cress usually over-top the flowers, whereas in Wavy Bitter-cress the pods are usually lower than the top-most flower (but this is not a reliable indicator going by the flowers in the above photos; whereas the number of stamens is definitive). 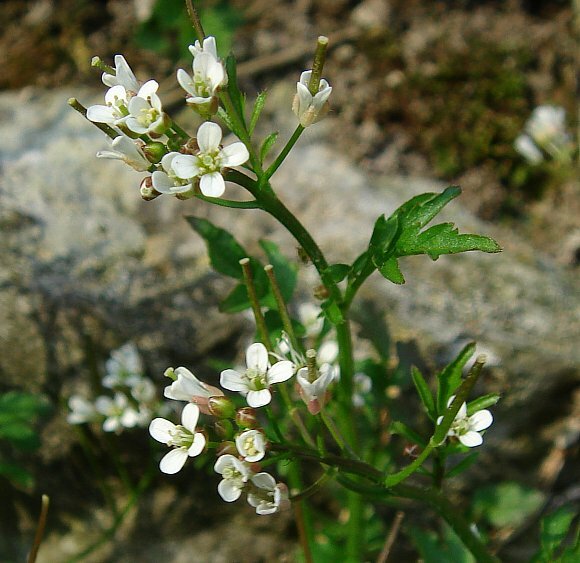 Wavy Bitter-cress has nominally six stamens whereas Hairy Bitter-cress has but four. 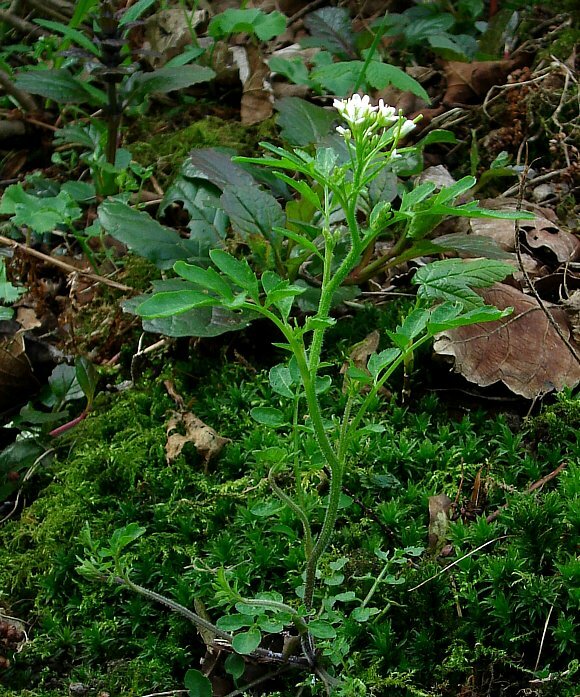 The number of stem leaves also differs: Wavy Bitter-cress has between four and ten whereas Hairy Bitter-cress has only one to four stem leaves. 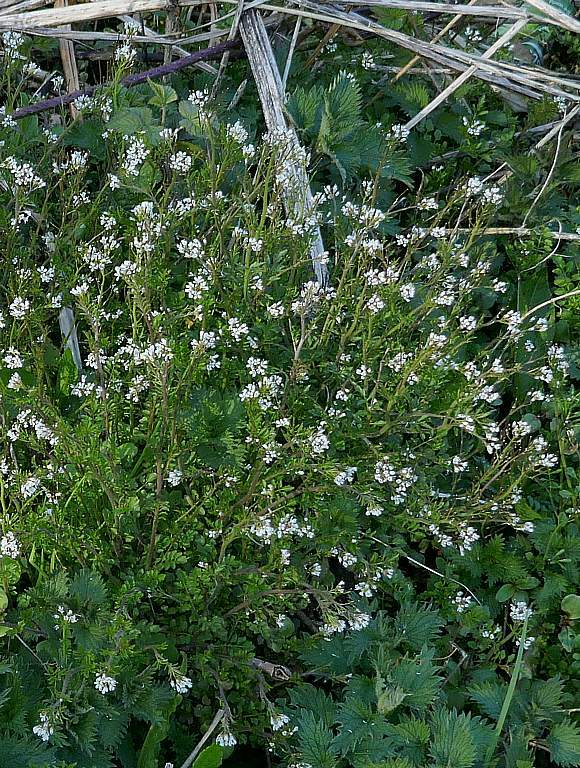 Although the leaves of Wavy Bitter-cress are hairless, those of Hairy Bitter-cress only might possibly be hairy. No relation to : Wavy St John's Wort nor to Wavyleaf Sea-Lavender [plants with similar names]. but luckily both of these are present in but very few locations, and are not present where the above photographs were taken. Wavy Bitter-cress is very weedy. if you have it in your garden, you will like as not never get rid of it for good. It favours damp and disturbed ground in the shade. Not averse to mud, marshes or stream-sides and mountains. Almost, but not quite, ubiquitous throughout the UK. But beware about using the number of stamens as the sole identifier. 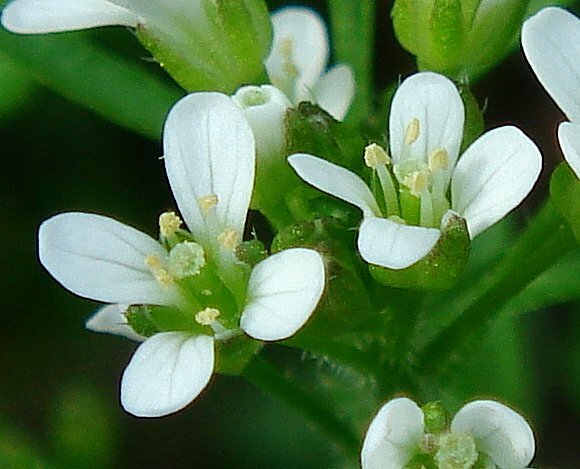 Wavy Bitter-cress is most likely to have 6 stamens (2 deeper down in the flower than the rest) but it can have only 5 or only 4. 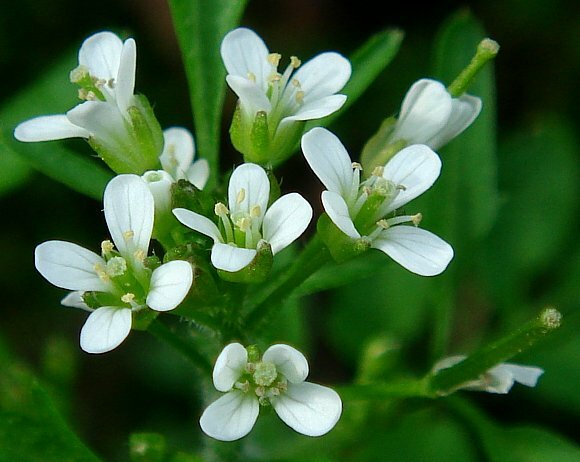 Likewise, Hairy Bitter-cress is most likely to have only 4 stamens, but it can have 5 or 6! Use as many other differing characteristics as possible for ID. 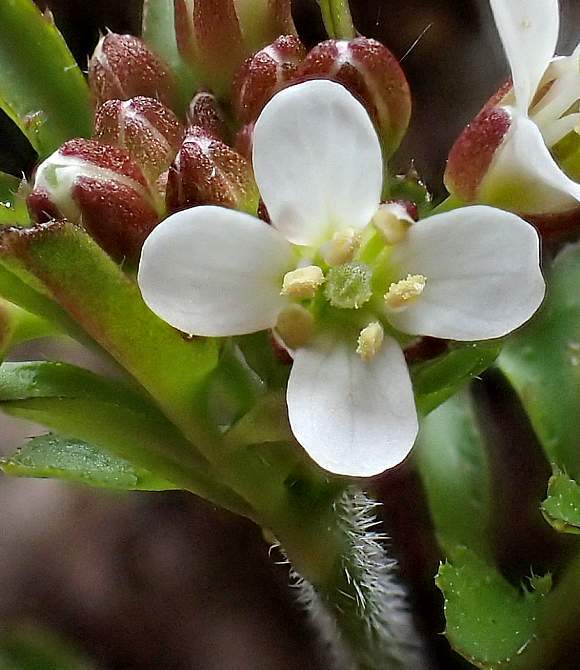 Wavy Bittercress usually has 6 stamens rather than the 4 of Hairy Bitter-cress. But some flowers on it may also have only 4 stamens. Four of the stamens are arranged one each in the 4 corners of a square, with the 2 extra stamens being outside that square to form a hexagon. Moreover, the 2 extra stamens are shorter than the other 4 and the reader may miscount the number of stamens in the flower. 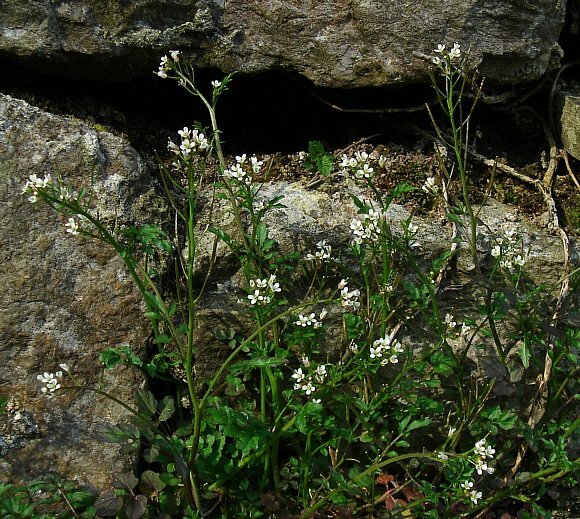 Thus Wavy Bittercress can exhibit Heterostyly, or to be more correct, it is tristylous. 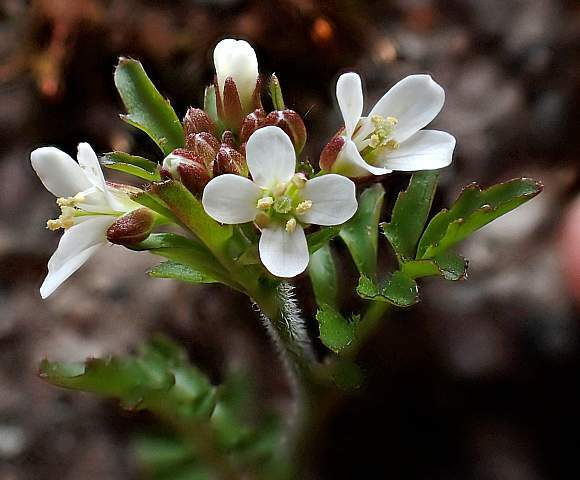 However, Wavy Bittercress does deviate from the definition of heterostyly: the relative heights of the 2 sets of anthers and the stigma are the same for each flower; they do not change from flower to flower as they do in other heterostylous flowers.